While it might not have been as unusual as a left-handed second basemen, Monty Fariss still got some looks at his chosen position of shortstop, according to The South Florida Sun-Sentinel. Listed at up to 6 feet, 5 inches tall, Fariss was a rare tall fielder at short, something Fariss was unconcerned about talking to The Sun-Sentinel in 1991. "Shortstop has felt like my natural position ever since I first started playing as a kid. Being big has never bothered me, or hurt my play," Fariss told The Sun-Sentinel. "Being a big shortstop gives me some advantages. I can cover as much or more ground than anyone going from side to side, and offensively I can hit with some power." "A big shortstop has the ability to field and really produce at the plate," he told The Sun-Sentinel. "That's a great combination." Fariss spoke to The Sun-Sentinel as he was fighting for a spot that spring on the Rangers' roster. He wouldn't make it that spring, but he did make Texas as a September call-up. He never really produced at the plate. And he never made it as a shortstop. Fariss was taken by the Rangers in the first round of the 1988 draft, the sixth pick overall. The Oklahoma State product was sent almost directly to AA Tulsa, where he stayed into 1990. He made AAA Oklahoma City that year. 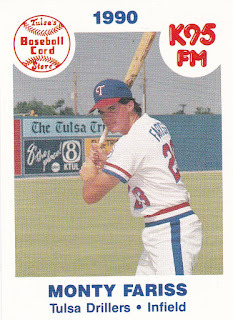 He got the callup to Dallas in September 1991, playing in 19 games that month. He hit .258 and had one home run. He also played outfield and second base, no short. He played 67 more games with Texas in 1992 posting just a .217 batting average before being selected by the Marlins in the expansion draft. Eighteen games with Florida in 1993 with a .173 batting average and Fariss' major league career was done. Fariss stayed on with Florida at AAA for 1994 and returned briefly with the Cubs at AAA Iowa in 1995 and Fariss was done. But in spring training 1992, the tall non-shortstop battled for a Rangers starting job. Julio Franco was injured, and there was talk of Fariss starting the opener. "I don't know," Fariss told The Sarasota Herald-Tribune about starting. "I hope so. If he (Franco) is ready to go, then he'll be the second baseman. I think it's just a matter of me being ready to go in case he's not. I just want to take advantage of the opportunity."